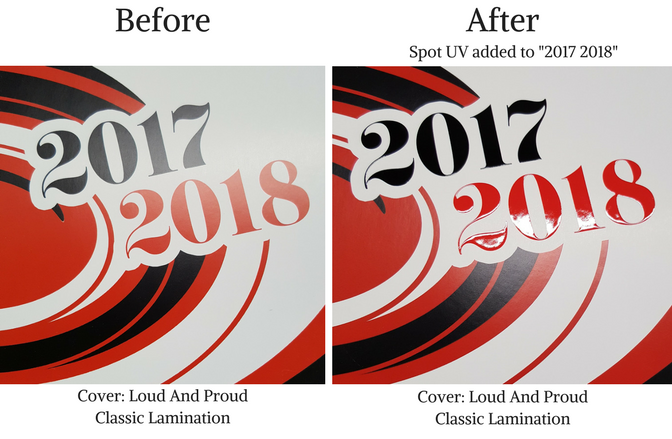 Announcing a new lamination option called Spot UV! 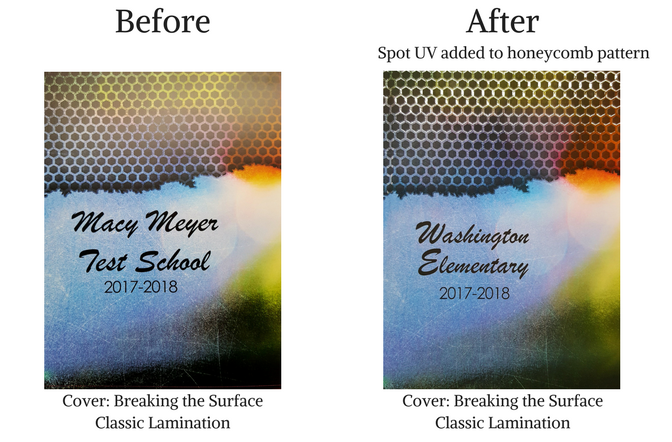 Spot UV can be added to any yearbook cover to add dimensionality, brighten colors, and provide a textured surface. It doesn’t coat the whole cover like other lamination options, so it can be added to any existing design to highlight details. Custom cover with Satin Lamination and Spot UV creates the tiger stripes and details in the mascot’s face. A special machine applies this coating as a liquid, referencing computer files to know where on the cover it should be placed. Then, the machine places the cover under a UV light that hardens the liquid into the shiny, plastic-like coating. The whole process happens quickly, but the results are astonishing. Use in combination with the Satin finish to get the biggest impact. The contrast in textures looks and feels very unique. Make dark colors more vibrant by finishing with spot UV. On a monochromatic cover, choose this option for a single design, like a mascot, without accompanying ink. The tiger stripes on the cover below were finished in this way. This is a custom cover with a Satin Lamination. 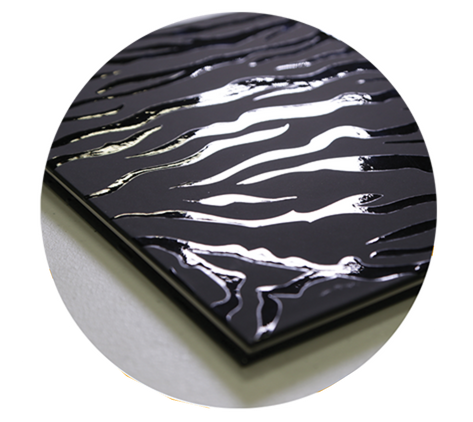 See the striking contrast between the matte finish of the Satin Lamination and the glossy finish of the Spot UV? To get more information about Spot UV, call 1-800-451-0507 or click here.